Plants use sunlight to make energy. The process by which they do this is called photosynthesis. Chlorophyll in the plant is the pigment that absorbs light. Light is made up of three different colors: red, blue and green. 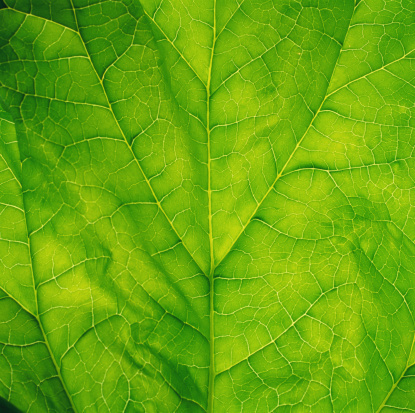 The reason that green plants appear that color is that they reflect that color in the light spectrum. In other words, the chlorophyll in the plant absorbs the red and blue light much more readily than the green light. Though green light has the least benefit to plants, red and blue light can have different but complementary effects on plant growth. Chlorophyll and other photosynthetic pigments (called phytopigments) have distinct spectra that show what wavelengths of light they absorb to perform photosynthesis. Chlorophyll is most strongly absorbent of light in the blue region, but also has a strong absorption in parts of the ultraviolet spectrum. Black lights emit ultraviolet light, and can have different effects on the growth of plants. Black lights emit ultraviolet radiation in the UVA (320 to 400 nanometer wavelength) and in the UVB (290 to 320 nanometer) region. Chlorophyll in plants is strongly absorbent of longer wavelength UVA radiation. However, strong UV radiation can bleach phytopigments. Different types of UV light may have different effects on different types of plants. UV light, particularly UVB, can cause DNA mutations called thymine dimers. This is reversible damage to DNA that is usually automatically corrected in the presence of white light. Growing plants under black lights without white light may be harmful to the plants. Plants predominantly use chlorophyll a for photosynthesis. However, other pigments are also used to aid in photosynthesis and also as photo-protectant pigments. This is clearly seen in the many leaf colors of houseplants that are available from growers. Plants with different pigments may react differently to being grown under a black light. The main types of photosynthetic pigments are chlorophylls and carotenoids. There are hundreds of different types of these phytopigments and they are found in different species in tens of thousands of different combinations. Plants grown under black light may react by changing the ratios or quantities of their different phytopigments. For instance, carotenoids can be enriched or depleted depending on the species and wavelength of UV light that the plants are exposed to. Enriching compounds like carotenoids can make the plant more nutritious. More than 97 percent of all UV light is filtered out naturally in the upper atmosphere before it reaches Earth. Almost all of the UV light that reaches Earth is UVA. Growing plants under black light conditions may be interesting but it is certainly unlike conditions plants in nature would experience. Because different species react differently to UV light, and even to different wavelengths of UV light, it is impossible to say how one species would react to a certain wavelength of UV light. Researchers have found, for instance, that plant growth is substantially increased by removing UV light from white light sources.